Welcome to Tri-State Concrete Services located in Stewartstown, Pennsylvania. Family owned and operated, Tri-State has been serving the York, Adams, Lancaster, Harrisburg, Baltimore and Harford Counties for close to ten years! 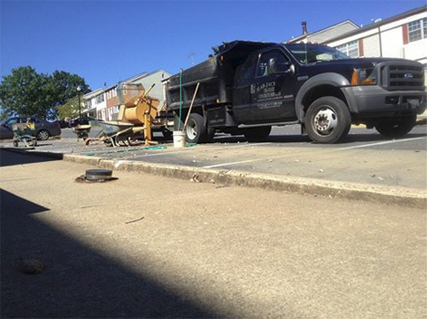 The main body of work performed by Tri-State Concrete is Slab Jacking. What is Slab Jacking? Visit our Slab Jacking page to find out more! Tri-State Concrete Services goal is to provide the highest quality repairs through workmanship, the materials we use, and experienced techniques. Tri-State Concrete Services works as a team to provide cost efficient solutions instead of unnecessary replacements or repairs. WHY CHOOSE SLAB JACKING OVER REPLACEMENT?